Habits where are they leading you? Your daily habits will determine the outcome of your life. The secret to your success can be found in your daily agenda. Successful people don’t just drift to victory. Individuals who achieve big dreams don’t get there by accident. The longer you practice good habits in a positive, disciplined, and focused way, the greater the chance your future will be positive. The longer you practice bad habits, the greater the chance it will be negative. Habits have a cumulative effect – but the results don’t usually show up until much later in life. If the habits are bad, by the time the damage is evident, it’s often too late to alter the results. That’s why you need to take control of your habits at your earliest opportunity! His solution? Cultivate the right habits and practice them regularly. Remember, life is nothing more than the sum total of many successful years; a successful year is nothing more than the sum total of many successful months; a successful month is nothing more than the sum total of many successful weeks; a successful week is nothing more than the sum total of many successful days. That’s why practicing successful habits day in and day out is the most certain way to win over the long term. Habits are important in achieving your dream. If your habits don’t line up with your dream, then you need to either change your habits or change your dream. If you want to hold on to your dream, then be prepared for a battle to change your habits because a bad habit never goes away by itself. But you have to be willing to make such changes. Won’t the effort be worth it if you know that down the road your new habits are going to get you closer to your dream? Think of it as your very own undo-it-yourself project. When we start a new program to change our lives it goes against the habits that we have created over the years. This is why it is so important to schedule out our days and weeks. It will feel un-natural to do something different but as we do stick to the new way of life and form new habits we will start reaching the goals that we ultimately want to achieve. Tai Cheng™: Mobility, Agility, Vitality. Everything is about to feel better.Who is Tai Cheng for? 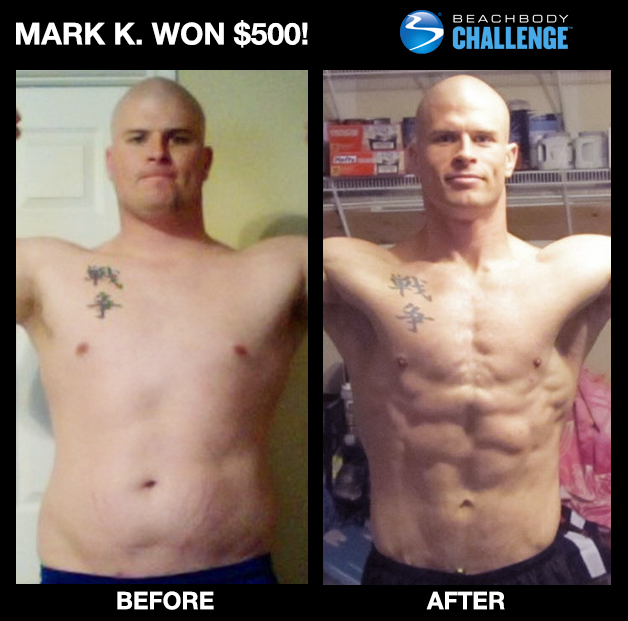 Dr. Mark Cheng worked with Beachbody® to create Tai Cheng. Cordastra is for anyone who wants to help strengthen their immune system, maximize natural energy levels, recover from workouts or protect against physical and emotional stress. If you want to play Texas football (especially in college), you gotta be BIG—and big I was. I was a 6’ 3” strong muscle machine. But years later, I was still big—yet a lot of that muscle wasn’t muscle anymore. Instead, it was…well…let’s just say, it was the opposite of muscle. I was still in my 20’s and the last thing I wanted to do was grow old as a fat person, popping a bunch of pills to stay “healthy”. No, I wanted to be in shape again so I could be a good role model for my future children. And while I knew what I wanted, all I had to do was change. So I did. I ended up losing over 70 lbs. with P90X/INSANITY Hybrid, P90X2, and INSANITY: THE ASYLUM Vol. 1 and Vol. 2. But it wasn’t like the fat just melted away. During my first round of P90X, I didn’t pay any attention to my diet and my results were pretty pathetic. Next go around, I tracked my calories and it really helped me dial in on my nutrition. I had no idea how big of a role food played in my health. But now I do. After awhile, losing weight became pretty easy, so I began to focus on how to put on some good weight to get my old body back. I took advantage of the “cold months” here in Texas to Beast Up, and boy, I’m so glad I did. Body Beast was amazing and I loved every single workout. I was lifting all the time and putting on a ton of mass. Plus, eating more was a nice change, although consuming that many calories was tougher than I thought. Tracking my food and drinking Shakeology were my two “difference-makers” during my transformation. By drinking Shakeology daily, I was getting a healthy, all-natural meal without tons of calories or fat. Plus, I had fewer cravings, more energy, and slept better (even though I wake up at 4:40 a.m. to work out). 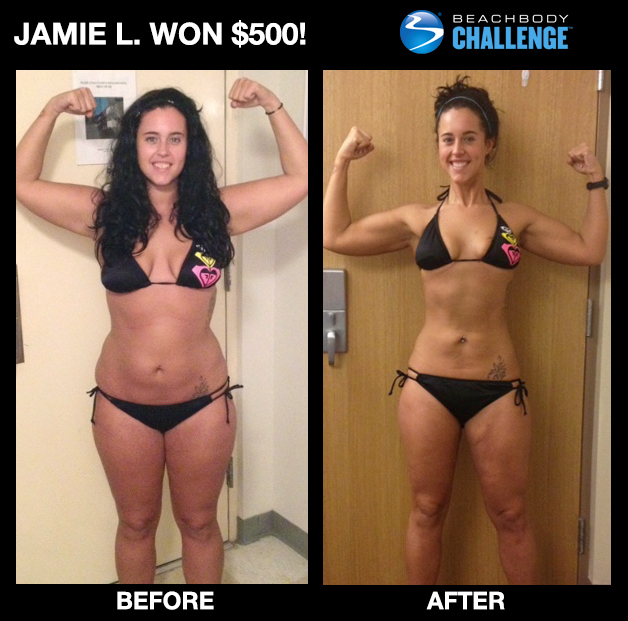 What Beachbody did for my life inspired me so much that I decided to become a Coach and “pay it forward”. My true passion is to help others and tell them EVERYTHING I know so they can get to where I am, as fast as possible. These Beachbody programs are life changers, as long as you stick with them and give every workout your all. My advice: Don’t focus on the scale or short-term goals. Put in the work and the results will come, no matter what. Don’t get discouraged when the scale doesn’t change much in a week. Keep doing what you are doing, and in the long run, you’ll get the results you want. Trust me! I did. And so can you. Apparently it worked, because in 6 months I lost 30 lbs., went from a size 14 to an 8, and for the first time in my life, I’m finally comfortable in my own skin. Gone is the bitter and angry Jamie—and here to stay is a happy, healthy, confident woman who loves talking to strangers about health and fitness. Now every time I go to the gym, I make it a point to grab a 30 lb. dumbbell and do squats or shrugs, just so I can remind myself of how much weight I’ve lost. My next goal is to grab a 50 lb. dumbbell, and do the exact same thing. Sometimes I still can’t believe that in only 6 months, I went from barely being able to stand for five minutes, to doing P90X’s Plyometrics, and kicking and jumping with INSANITY and Turbo Fire. And even though I have to modify the workouts due to my knee, I’m still getting great results. During my second round of P90X, I even incorporated INSANITY into my workouts—a program I thought I’d NEVER be able to do. See, it just shows you that once you start believing in yourself, amazing things can happen. I also started using Shakeology at the end of month 2 and immediately saw a reduction in my cravings for carbs and sweets. Now I drink it every night for dinner. I recently did the 3-day Shakeology cleanse and lost 6 lbs. It took away the bloating in my stomach, my whole body felt lighter, and my workouts really began to accelerate. In these past 6 months, I’ve not only transformed my body, I’ve completely rewired my mind. I’m such a happier, healthier person who’s now incredibly confident and determined to build a strong and healthy future.